Centrifugal fans are extremely powerful fans that are used to keep the air inside of industrial facilities clean. When they’re working properly, centrifugal fans can remove particulates from the air and prevent them from contaminating a facility. This makes life easier on those working in industrial facilities and also protects industrial equipment. There are some issues that you may run into when you utilize centrifugal fans, though. Here are several troubleshooting issues to look out for at all times. Your centrifugal fan isn’t producing the proper airflow. When your centrifugal fan is turned on, you should notice it moving large amounts of air around at any given moment. If it’s not, that’s an issue. There are several reasons why this might happen. In some instances, you might have broken belts within your centrifugal fan. In others, you might have a pipe leak or a broken drive coupling. 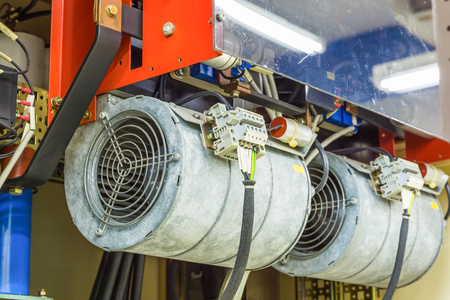 Whatever the case, it’s a good idea to shut your centrifugal fan down and have it inspected as soon as possible to get it up and running again. The blower in your centrifugal fan isn’t rotating. Another common troubleshooting issue with your centrifugal fan will occur when the blower inside of it stops rotating. This can happen if rust builds up in your blower impeller chamber. It can also take place if there is damage that has been done to your motor winding. You could even have an electrical wiring issue on your hands. You’ll usually need to turn your centrifugal fan off and take the blower apart to investigate the source of the problem. You notice oil leaking from your centrifugal fan. It’s not out of the ordinary to see a centrifugal fan leaking a little bit of oil. Nevertheless, if you notice a lot of oil leaking onto the floor under your centrifugal fan, this should be a major cause for concern. Your centrifugal fan can lose lubrication due to a worn seal, a blown gasket, a loose drain plug, or any number of other things. You should attempt to see if you can locate the cause of the leak or call on a professional for help. If your centrifugal fan isn’t working the way it should right now, let Dynamic Fan come to your industrial facility and check it out. We can service centrifugal fans and provide you with motors, pulleys, belts, and other replacement parts. Call us at 973-244-2422 today to set up an appointment.